No matter if you look at them as the club that were founded in 1945 as FD Dinamo, or, as they claim, as the direct heir of HŠK Građanski, founded in 1911 and very successful in pre-Yugoslavia times, Dinamo Zagreb are the biggest Croatian club, regardless of the fact that Hajduk Split won the Yugoslav First League more times than them. After the dissolution of former Yugoslavia, Dinamo... stepped on it, and the numbers between the two clubs these days cannot even be compared. 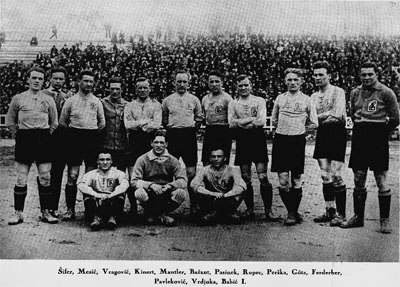 According to some sources, the team were founded in 1945, after the creation of former Yugoslavia, in times when Croatian clubs that pre-existed, like HAŠK, Građanski and Concordia, had to be disbanded, considered too “nationalistic” by the new regime. Dinamo themselves though, as they clearly state on their official website, and as they have repeatedly stated since Croatian independence in the early nineties, consider themselves one and the same with HŠK Građanski, one of the most successful clubs in Croatia before World War II. The club changed name again after Croatia became an independent country. They won their first national titles and made a name for themselves in Europe as “Croatia Zagreb”, before switching back to “Dinamo Zagreb” in 2000. In 2011, they added the word “Građanski” before “Nogometni Klub”, and ever since then they have been called GNK (Citizens Football Club) Dinamo Zagreb. The team won national titles in the forties, fifties, sixties, eighties (the seventies were by far their worst decade), in 1967 they even won the Inter-Cities Fairs Cup, but all in all, in former Yugoslavia times, they were second best to Hajduk Split. It was after Croatia's independence that Dinamo really “exploded”, titles-wise, leaving Hajduk second most of the nineties. The new millennium saw Dinamo turn from “big” to “huge”. Incredible as it may seem, starting from the 2005-06 season, they were the only champions Croatia had until 2017, creating a real football empire within their national borders, and having some memorable wins at international level as well, to further enhance the club's prestige. Dražen Ladić, an 1.85m (6 ft 1 in) tall goalkeeper, who played for Dinamo from 1986 to 2000, has worn their jersey more times than anyone else, 801, but it should be noted that many of those games were not official. Still, he is considered to be the most capped player in the club's history. One of his teammates from 1989 to 1997 and then again in 1999 and 2000, Igor Cvitanović, holds Dinamo's scoring record, having found the back of the net for them an impressive 304 times. Dinamo have been playing at their Maksimir Stadium since the forties, obviously modernizing it on a number of occasions. Their dominance in Croatia has not been hindered by the fact that they use to sell abroad their biggest talents, partly because Hajduk are doing exactly the same thing. Players like Luka Modrić, Mario Mandžukić, Mateo Kovačić, just to name three of many, first became famous playing for Dinamo, bringing the club respectable sums of money. Dinamo are sometimes accused by fans of other clubs that they use... questionable tactics to stay at the top, but no matter how true or not that is, and if yes to what extent, no one can deny that they are the most successful Croatian club of all times. No surprise, the very characteristic and recognizable red and white Croatian checkerboard covers half of Dinamo's logo, with a big “d” dominating the other half. Obviously, during former Yugoslavia times, the Croatian checkerboard was missing, and the logo consisted of a big “d”, accompanied by a red star, and the initials/word “NK DINAMO” on top.